YouTube Videos Not Always Playing - Why? Home > Google News > Misc Google > YouTube Videos Not Always Playing - Why? I have a personal pet peeve with YouTube. Way too often, when I try watching a YouTube video, it simply won't play. 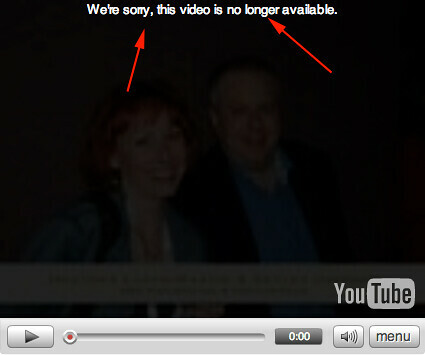 The message I get is "We're sorry, this video is no longer available." The thing is, the video is available. All you need to do is refresh the page and play it again and often, it will work. Why does this bother me? I don't watch man YouTube videos, but I do offer a weekly video blog that is published to iTunes and also to YouTube. And for each person that hits play on the YouTube version, I would say about 50% get this error. It is not limited to my videos, it happens to virtually all the videos I try. YouTube has an on going thread on this at Google Groups but all we have are complaints, moderated by a YouTube representative. There are over 200 messages in that thread. The solution? I do not know. This post was written on Monday, October 13th and scheduled to go live today.